Serving a gorgeous, healthy and delicious brunch is one of my very favorite ways to entertain. 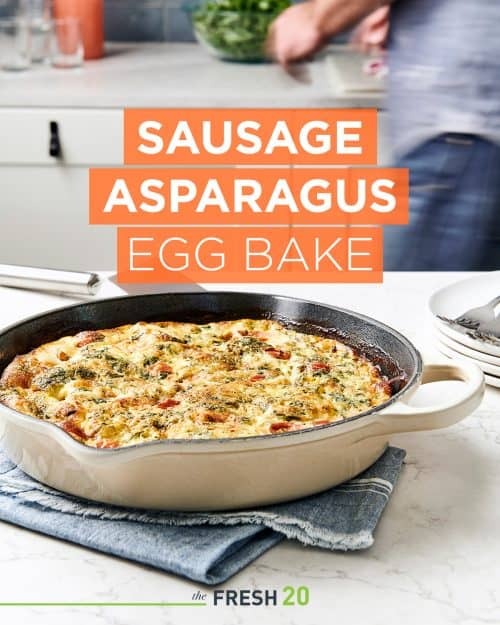 This sausage asparagus egg bake is a recipe that my friends and family request over and over again, which is great, because it’s simple and foolproof — a win-win! It’s the perfect savory main dish for any breakfast or brunch, but it really shines during spring when asparagus are in season. In addition to entertaining, this is also a winner for meal-prep. If you’re looking for a breakfast you can make on Sunday and enjoy for several days, pack this in individual portions, refrigerate and enjoy within 4 days. Brunch is all about balance of savory and sweet dishes that work together to satisfy and nourish every craving. This sausage asparagus egg bake is the anchor, and I serve it with pancakes with berry compote, these cauliflower hashbrowns, salmon avocado toasts and a simple green salad. Savory sausage, asparagus, fresh tomatoes, tangy cheese and creamy eggs come together to make this a crowd-pleaser for Easter brunch. 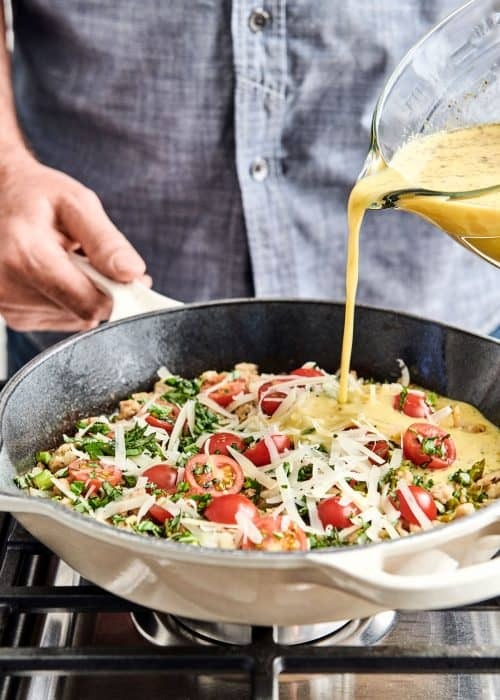 Sausage egg asparagus bake with fresh tomatoes, aromatic basil and tangy cheese, perfect for spring brunch. Heat large skillet over medium heat and add sausage, crumbling as it cooks for about 5 minutes. Add onion, garlic and asparagus for about 2-3 minutes. Pour into greased 9×13 dish and layer tomatoes on top. Whisk together the salt, pepper, herbes, basil, eggs, milk and cheese. Pour on top of veggies. Bake for about 35-45 minutes. Allow to set for at least 5 minutes before cutting. You can pour egg mixture directly into skillet (instead of into a greased dish) and bake if it the skillet is oven safe up to 375 degrees. This works really well in a cast-iron skillet.